Where "The Tyrant" publishing franchise goes from here. King Midas World Entertainment, Inc. reached agreement with Tor/Forge/McMillan for the publication in North America of the second "Tyrant" Novel. The Company is planning to coincide the publication with other releases of the brand, including potentially the first Film of the franchise currently in the active stages of development. King Midas World Entertainment through its affilites is licensing the literary property for publications around the world. 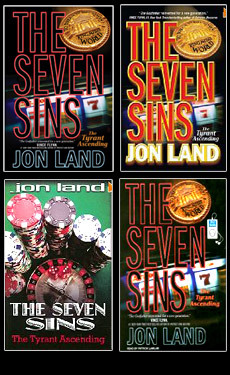 King Midas World Entertainment, Inc., bursted in the publishing world in June 2008 with the release of the "Seven Sins the Tyrant Ascending, (first of a series) becoming a National Best Seller and nominated Best Thriller of the year by the Library Journal. Developed in conjunction with Tor/Forge Books, King Midas World Entertainment, Inc. founder Fabrizio Boccardi unleashed the first phase of his vision for this exciting and unique Brand, "The Tyrant". This breathtaking action adventure thriller, written in conjunction with bestselling author Jon Land, tells the tale of Michael Tiranno (Tiranno is the Italian for “tyrant”) through the story of his harsh childhood in Sicily to his meteoric and unconventional rise in Las Vegas to the creation of an American Empire. The ancient motto, inscribed in Latin on a mysterious golden medallion, recovered from the ruins of the Roman Empire, has guided Michael Tiranno to heights few men have achieved. Once an orphaned farm boy in his native Sicily, Michael made millions by mastering the intricate world of high finance, and is now the fabulously wealthy owner of Las Vegas' The Seven Sins, the grandest and most extravagant casino in the world. The lavish resort embodies the personal philosophy fueled by his lust for power: the greater the risk, the greater the reward. Selected as a best Thriller of the year. The second book in The Tyrant series branded as Fabrizio Boccardi's The Tyrant has been announced and is currently in development with bestselling author Jon Land for publication in North America by the Macmillan Publishing Group. A film based on the adaptation of the novel is in the active stages of development in Hollywood. 'The Tyrant' began its transformation into a concept for an exciting and innovative life style brand and media franchise applicable in numerous industry segments and product lines, that the Company is in the process to take to market globally. With the Tyrant, we are creating a new super hero Franchise that will endure the test of time.